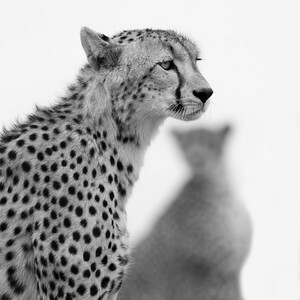 I was so taken by this scene of a cheetah moving across the plains of Mashatu in Botswana that I did not realize the bokeh of another cheetah in the background. 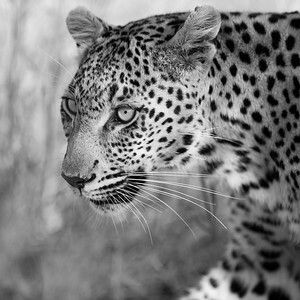 It creates an interesting allegory for the challenges facing this magnificent cat. 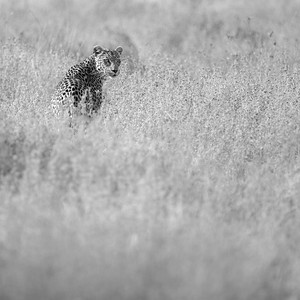 This young leopard cub was one of the most enjoyable photographic subjects I've encountered. 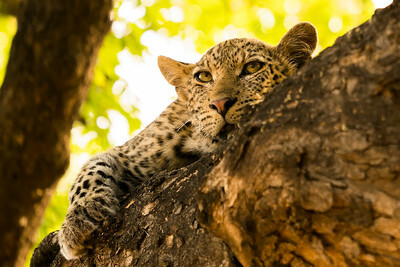 A wonderful time spent snapping shots as it drifted in and out of sleep on a slow afternoon in the African bush. 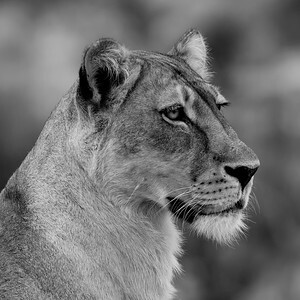 I have seen many lions in my life but none compete with the closeness and intrigue of this encounter. I attempted to capture this shot with as much detail as possible to retain the life-like portrait of this queen. It was a windy and cool morning on this game drive... which caused the grass in the foreground to blur with the motion of the wind. 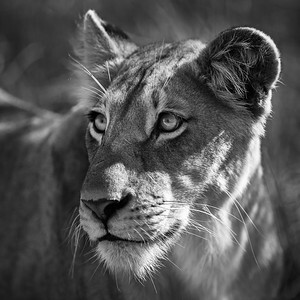 As lions continue to face alarming declines, I trust this title speaks more to the temporal nature of the grass than the big cat I captured here. 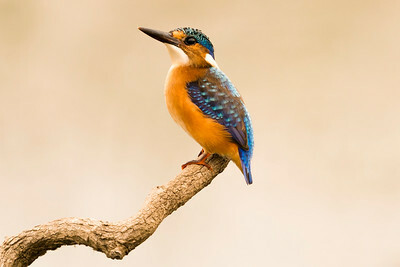 This juvenile Malachite Kingfisher is only 5 inches (13cm) and was darting around a wetland just south of Johannesburg. I managed to capture this shot as it came to rest briefly on a little stump in the middle of the water. It's beautiful metallic blue colors in full display! 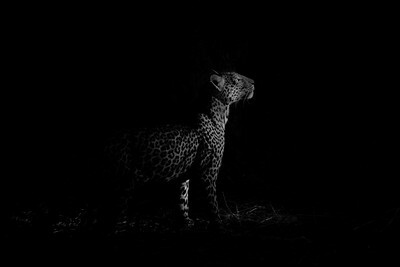 There's something incredible about seeing a leopard in the wild... and as if on cue... another guide shone his light on this leopard as the sun was setting. It perfectly isolated this silent huntress. 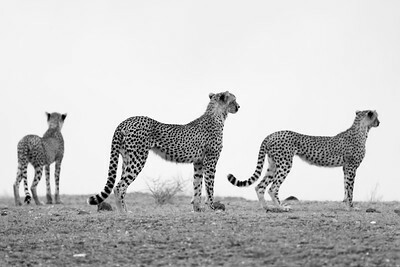 I had watched the day before as these three cheetahs and their mother successfully hunted a little klipspringer. It all started with a similar scene of alert attentiveness as they scanned the plains for their next prey. I spent time at the Wild Coast on the eastern coast of South Africa photographing the Lesser Crested Turn as it took off in droves from a desolate beach near Umngazi. 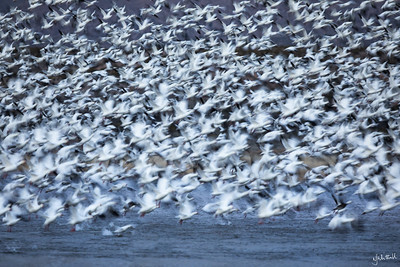 I purposefully slowed the shutter speed to capture the frantic motion of the birds in flight. My Dad and I were sitting in a hide enjoying a rare opportunity to photograph together... and we watched this swift tirelessly catching insects and then come in to feed it's chick. It was a special bonding moment for father and son, as I'm sure it was too for the chick. I should possibly have titled this "Lack of crowd control"... because as soon as one goose decides it's time to take flight, the entire flock leaps off the water almost in unison. 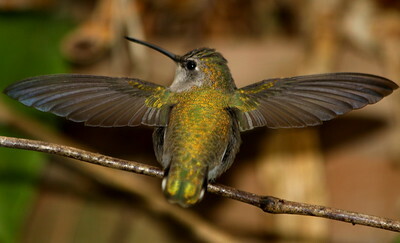 If you ever want to fine tune your motor skills, take up photographing hummingbirds as a hobby! They are so quick that one's camera is barely able to focus before the little bird is off to the next nectar-filled flower. This shot seems to freeze the hummingbird's hyper-activity and I think captures a slightly different look to the common frame of a hummingbird hovering near a flower. 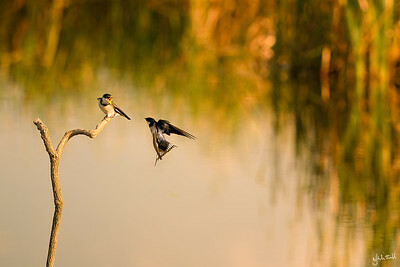 **Getaway Magazine Winner: Best Photo August 2011**. "Natural Design". 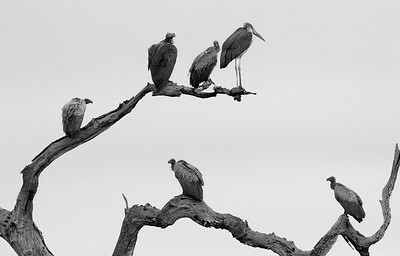 There’s a bird hide in the Kruger National Park that allows visitors to the hide to get out of their car. As I returned from a rather uneventful breakfast at the bird hide, I caught site of a speckle-breasted woodpecker. 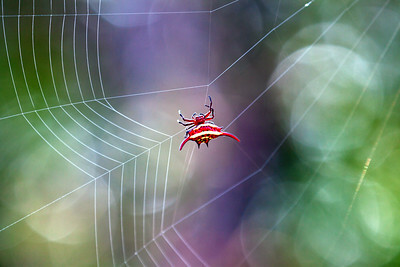 As I started to photograph the persistent bird as it tried to drill a hole in a tree stump – I noticed this brightly colored spider masterfully weaving its web. Against better judgment I spent a fair deal of time outside my car photographing this spider – and as the light streamed through the dense foliage – it lit up the spider and its creation. I'm not sure if you've ever been in a wildlife situation where you haven't wanted to breath too loudly in case you startled an apex predator. 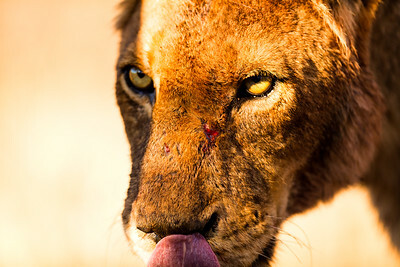 I shot this image with the superb Canon 300mm 2.8L lens. 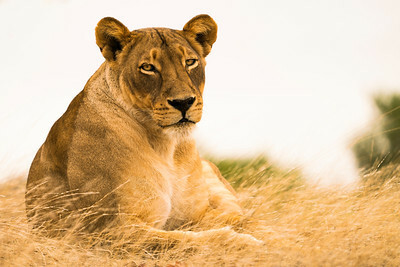 I couldn't zoom out as the lioness walked within feet of the vehicle. it paused a minute, licked its lip, stared me down (probably contemplating whether I'd be a good enough snack) and then moved on. After changing my pants, I took a deep breath and marveled at the intensity of the experience. It's unfortunate when cultural morays cause an animal such as a rhino to be indisciminately targeted for its horn. In 2007, 13 rhino were poached in South Africa... in 2010 the number jumped to 333 and in 2011 a staggering 448 rhino were poached! 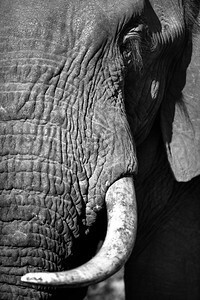 The fight continues to keep poachers away and to protect this species. I caught this shot later in the day and liked the shadow that's cast across the rhino's horn. 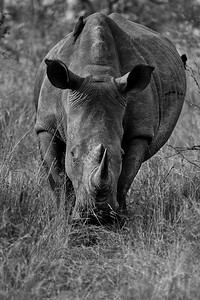 The grey color of the rhino and the brown wintery grass made for a good opportunity to process this as a black & white image. 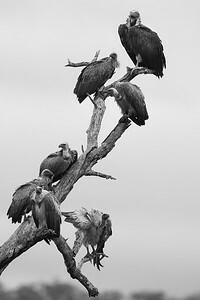 There's something ominous about a gathering of vultures in the dead branches of a tree! 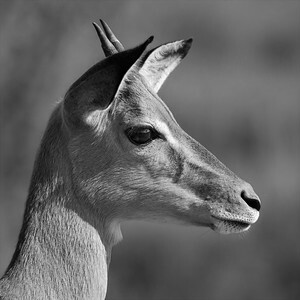 This image was captured on a rather gloomy day in the northern-most tip of the Kruger National Park near Pafuri. 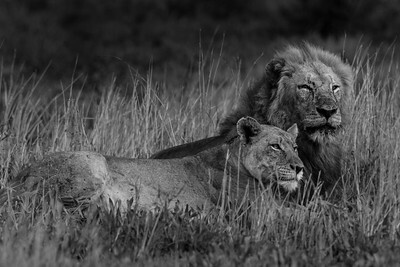 This breeding pair of lion have been through the ringer. The female... in the prime of her life... and the male... a battle hardened warrior who carries his scars on his face like badges of honor. This shot captures them as the morning sun was just rising... and before both of them fell fast asleep shortly after! 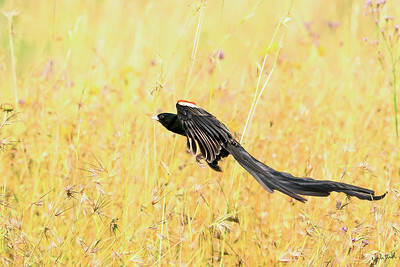 The long-tailed widow bird must be one of the most frustrating birds to photograph... due in part to it being so stunningly photogenic, while at the same time, incredibly shy. I snuck up on this one... and managed to catch a shot before it danced away through the grass. At school we used to have to wait at the "zebra crossing" for the scholar patrol team to blow the whistle and let you cross to the other side of the road. This shot was taken as an actual zebra was crossing the road. 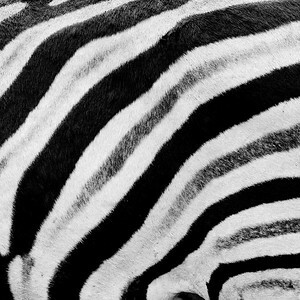 Instead of focusing on the zebra itself, I decided to frame the patterns on its side. 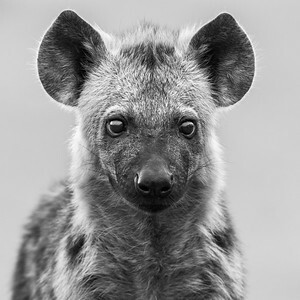 It's quite rare to find oneself this close to a hyena pup. They're generally kept out of site of the larger predators, such as lions. 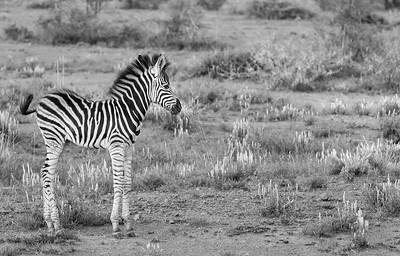 This little chap was the runt of the litter and its mother displayed quite interesting behavior when it drew up to her to feed. She actually snapped at this pup and let the other more developed pups continue feeding. 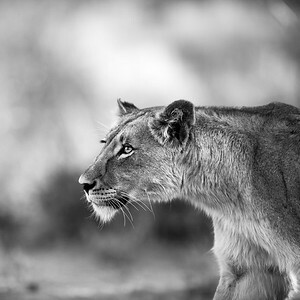 This can sometimes be Africa's cruel way of ensuring "survival of the fittest" and is also sometimes a way for the mother to push the pup to develop a competitive edge as it will soon enough have to fight for its right to feed. 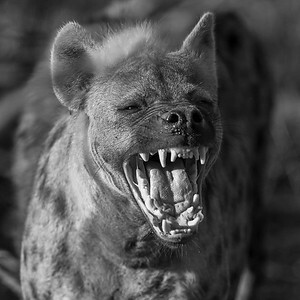 If this one succeeds in passing its mother's test, the innocence of youth will quickly give way to the more devious nature of an adult hyena.